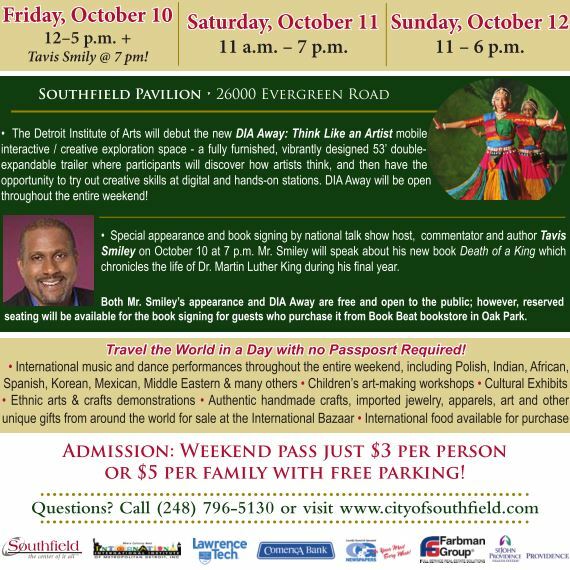 The city of Southfield, in partnership with the International Institute of Metropolitan Detroit, Inc., will sponsor the 91st annual International Festival Friday, October 10 – Sunday, October 12 in the Southfield Pavilion, 26000 Evergreen Road. The International Festival will kick-off on Friday, October 10 with a U.S. Citizenship & Immigration Services (CIS) swearing-in ceremony of new citizens at 10 a.m. Last year, more than 100 immigrants from 31 countries were sworn-in as new citizens. The Festival will continue on Friday until 5 p.m., Saturday, October 11 from 11 a.m.–7 p.m., and Sunday, October 12 from 11 a.m.–6 p.m. This year will feature the unveiling of the Detroit Institute of Arts’ (DIA) new DIA Away: Think Like an Artist mobile interactive classroom and creative exploration space throughout the entire weekend as well as a special book signing and presentation by national talk show host, commentator and author Tavis Smiley. Mr. Smiley will speak about his new book Death of a King which chronicles the life of Dr. Martin Luther King during his final year on Friday, October 10 at 7 p.m. in the Southfield Pavilion. Both Mr. Smiley’s appearance and the DIA Away exhibition are free and open to the public; however, reserved seating will be available for the book signing for guests who purchase it from Book Beat bookstore in Oak Park. artists think, and then have the opportunity to try out creative thinking skills at digital and hands-on stations. Visitors will be surprised and inspired to discover the connections between themselves and the ways artists think and work. DIA Away will be open throughout the Festival on Friday, October 10 from 12-5 p.m. and 7-9 p.m., and Saturday, October 11 and Sunday, October 12 from 12-6 p.m. The International Festival is a fun, affordable and enriching event for the entire family. The festival will offer international music and dance performances throughout the entire weekend, including: Polish, Indian, African, Spanish, Greek, Korean, Mexican, Middle Eastern, Ukrainian and many others; children’s art and craft making workshops; and cultural exhibits and demonstrations. Guests will also be able to purchase imported products, handmade crafts, jewelry, fabrics, apparels and other unique gifts from around the world at the International Bazaar. A variety of international and ethnic food will also be available for purchase. A weekend pass is just $3 per person or $5 per family with free parking. 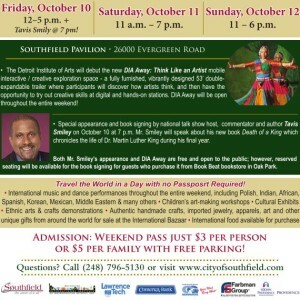 The 2014 International Festival is sponsored by the city of Southfield, International Institute of Metropolitan Detroit, Lawrence Technological University and C&G Newspapers. For more information, call Southfield Community Relations at (248) 796-5130 or visit www.cityofsouthfield.com. The city of Southfield is one of the premier business and residential addresses in Michigan. Located in Oakland County, Southfield is home to more than 71,000 residents and over 100 “Fortune 500” companies. With a daytime population nearing 175,000, over 27 million square feet of office space and more than seven million square feet of retail and industrial space–Southfield is truly Michigan’s undisputed business center. In fact, Southfield boasts more office space than the central business districts of Cleveland, Cincinnati, Detroit, Indianapolis or Kansas City. Residents and businesses alike come to Southfield for its central location, excellent city services and easy access to all of southeastern Michigan. For more information, call (248) 796-5000 or visit www.cityofsouthfield.com.